It’s that time again, and there’s plenty to share from Hayefield this month. 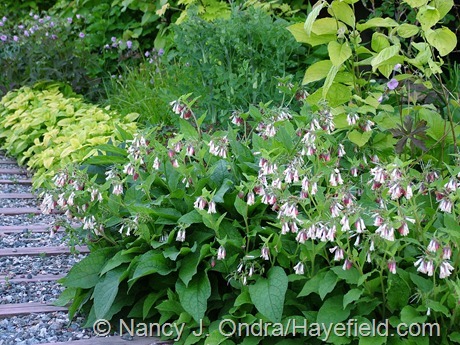 So, without further chatter, some highlights, starting above with Symphytum grandiflorum. 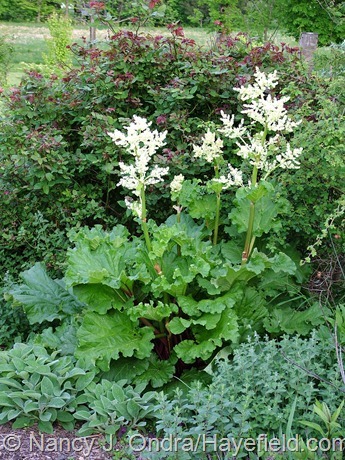 Below, rhubarb in bloom (Rheum rhabarbarum). 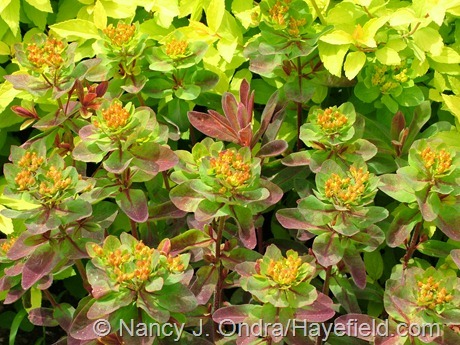 Now, check out what’s flowering today in gardens all over the world through the links at Carol’s Bloom Day post at May Dreams Gardens. Interesting plants and some I do not yet know. Greetings, Jo. I never before noticed how many “A”s are active at the moment. I saw another one opening just this morning, but of course I’ve forgotten it already…. Good night, Nan! How can your garden be so far ahead of mine? Could you really be a half-zone warmer, near as you are? 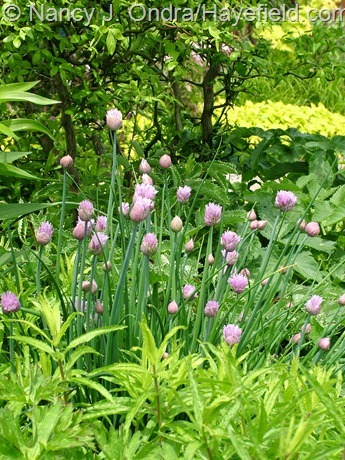 My chives and rhubarb are still in bud, and comfreys, peonies, geraniums, ajuga, etc. etc. aren’t even showing buds yet. Whoa! Love your ‘Belsay Gold’. Just gorgeous! Gee, that’s odd. 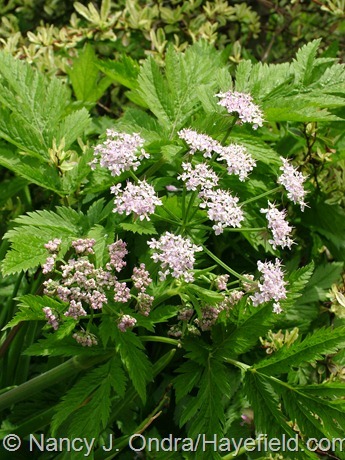 But things are coming along so quickly at the moment that yours may be in bloom by now! Nan – What a beautiful stroll through the garden. 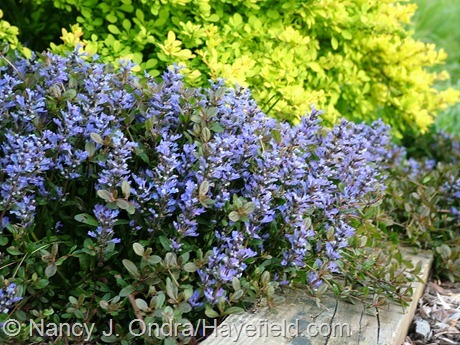 I just realized I forgot to note in my GGBD post that the ajuga in my garden is blooming. I got it at a plant swap years ago and don’t know the name but it is lusty, persistent and useful! Beautiful May blooms Nan. I love the way you combine plants. 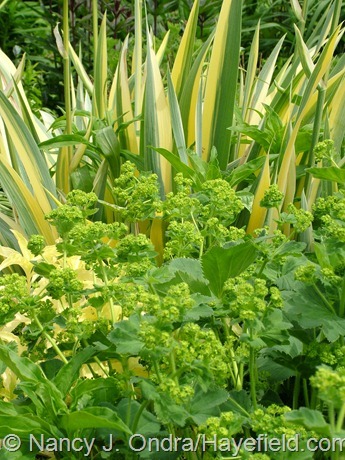 Lady’s mantle with the variegated iris behind it is stunning! I appreciate your comment about the iris-and-alchemilla combo, Linda. I passed over that one several times because I generally prefer stronger color contrasts, and this one seemed a little too soft. I finally decided to share it, though, because I think the contrasting forms give it sufficient oomph (forgive my use of technical terms) to be interesting. That ‘Grace Barker’ Soloman’s Seal is really neat! We just have the regular variegated one, I like how GB has an irregular pattern on the leaves. I haven’t had a great spot for ajuga until recently, I need to get out there and buy one soon. 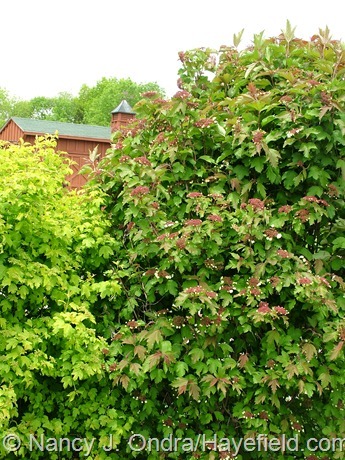 That viburnum is a pretty cool one too! Thanks, Dave! 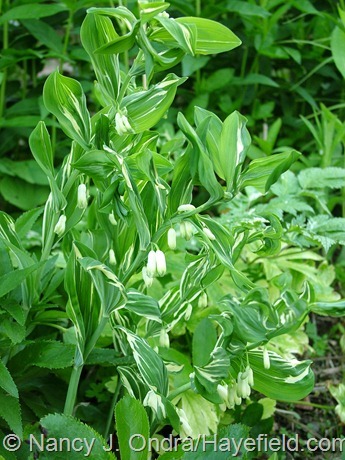 I happen to know that you can get the Solomon’s seal from Plant Delights, because I had to do a lot of Googling to track down the name on this one, and I finally found it at PD under the other name I vaguely remembered: Polygonatum x hybridum ‘Striatum’. Lovely photos! Beautiful colors! And such fun plant name. Chocolate chip? Espresso? I like it. Hey, a great idea for a new theme planting: The Caffienated Garden. Thanks, TM! Your post is a symphony in chartreuse, with variations in the colors I most like. There’s something about the simplicity of the species Peonies. They’re so graceful. Thanks, MMD. It’s been a long wait for the species peonies to bulk up and really put on a good show, but it’s been worth it. I actually like the seedpods best on P. mollis; they’re reddish purple when maturing, then dry to deep brown after they split and stick around all winter. And now it’s even starting to self-sow, which is very cool. Hi, Nan! My peonies will be blooming soon too. You always have such an interesting variety! Glad you stopped by, Robin. Happy Bloom Day! Awesome! I always feel like I should pare down the diversity of my garden- like it’s ‘bad design’ to have too many different kinds of plant. Screw it! I can do what is ‘good design’ or ‘tasteful’ for other people. I want my yard to be as beautiful and exuberant as Hayefield (albeit on a smaller scale). 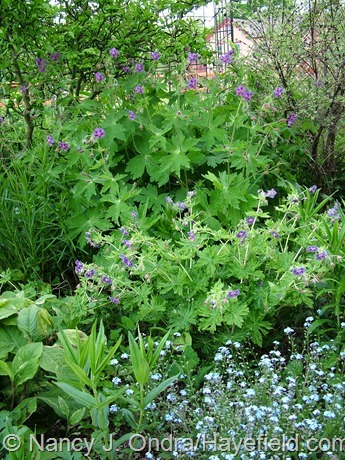 Thanks for the photos- I’ve got a few new plants to look for and include in my already over-diversified planting! Simplicity is an excellent approach, Cynthia, but I believe it’s best applied to other people’s gardens. In your own, anything goes! Nice flowers and really nice foliage, lots of different colors and textures. 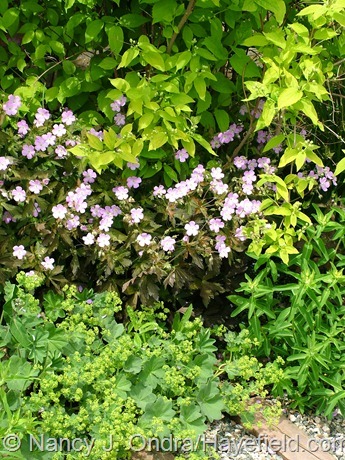 Not to dis the blooms, but these would all work for garden blogger foliage day, too. 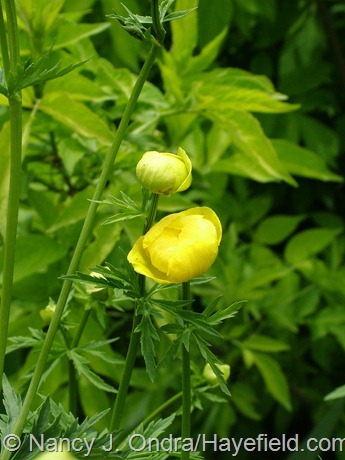 The globeflower is great. Thanks, Ryan. 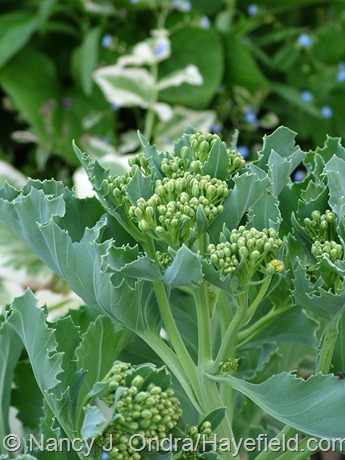 I’d be all for starting a Garden Bloggers’ Foliage Day, but then, every day is (or should be) Foliage Day! I appreciate you visiting, Yvonne! Happy Bloom Day to you too. Gorgeous plants. I’m especially intrigued to learn that orris root is an iris! Welcome, Rosemary. 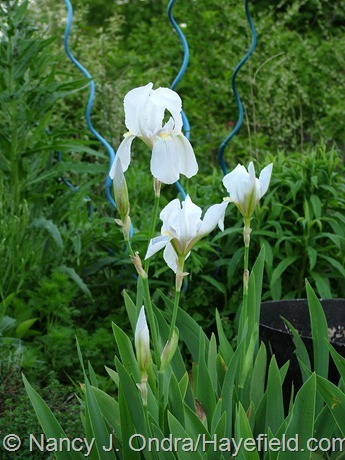 Yep, the dried, ground-up rhizomes of this iris are the common fixative used in potpourri. The plant is a good increaser, so I’d be able to make lots of potpourri if I were so inclined! Hey there, Shady. Yep, that’s Iris pallida ‘Variegata’; such a pretty thing. It’s been a good grower for me and I have several nice patches already, but it’s hard to resist buying more when I see it for sale. I hope yours does as well for you. You are really talented with placement. I love the way the leaves just stand out with their individual shapes. Every detail just pops right out. Thank you for the peony pics. Thanks for the kind comment, Cyd. I’m very fond of foliage too! Oh my goodness, so many lovely blooms! You must be very happy this time of year! :-) You may be interested to know that on your recommendation I bought three Amsonias online this year. So far they are sulking but I’ll try to be a patient gardener and let them be for at least a year. Your viburnum is spectacular. How great to hear that, Jean. Most of the amsonias do seem to take several years to fill out, but then they just get better and better each year, so they’re worth waiting for. 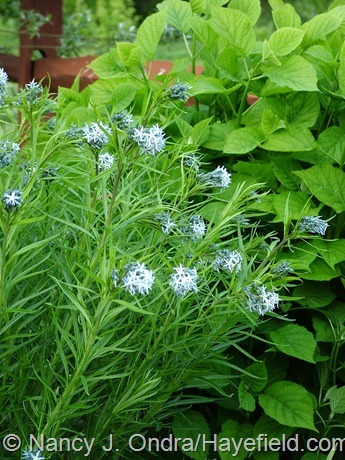 Great plants, and not just the usual suspects either. 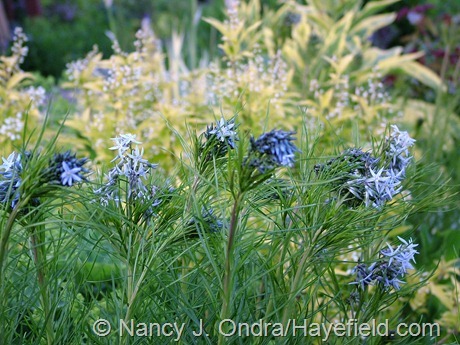 Love the trollius and amsonia. 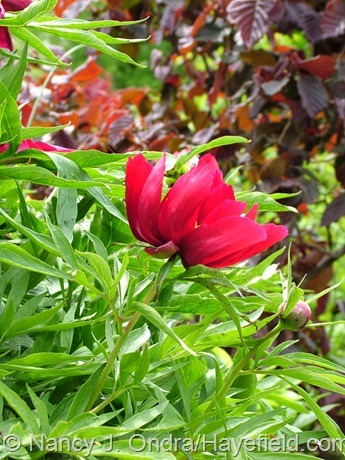 And those single peonies. Thanks for stopping by, Elizabeth! The trollius is even better now, in its full glory. It’s becoming a favorite of mine. Mango Lass-what a cool name! 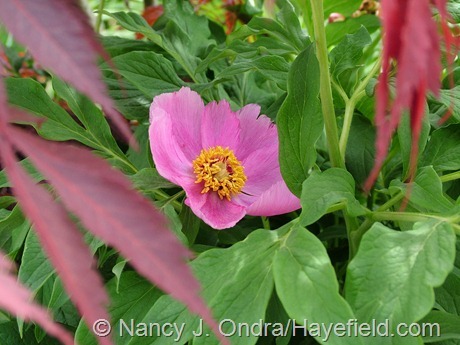 Beautiful pics and compositions, as always, though most of these plants are new to me. 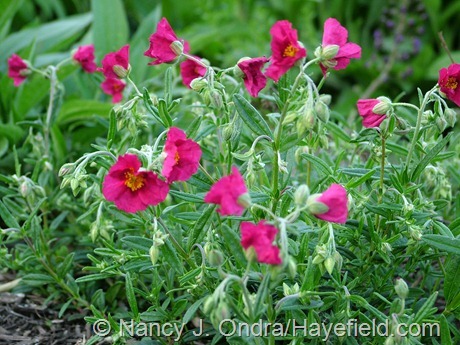 Yes, I don’t think geums would do too well in your climate; even here they seem to get heat-stressed by midsummer. But they’re nice in bloom, anyway. Gorgeous and inspiring, as always! I appreciate you checking in, HG! You have a wonderful selection of flowers Nan. I am always amazed that you know the names of all of them. Of course you would know them. I just wish I could do the same. Have you considered that I could just be making up the names as I go along, Lisa? But you’re right, it’s my job to know their proper names as much as possible. Good to have you visit again, Kim. I was just wondering how you’re doing. I hope your crambe is treating you to some blooms by now. 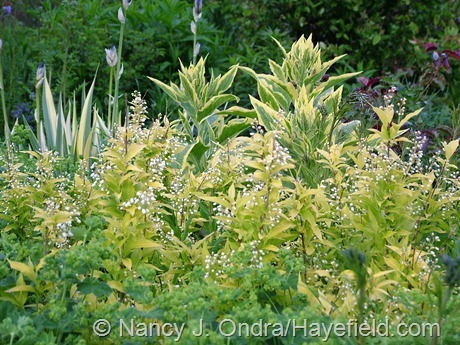 I found your garden googling Syneilesis aconitifolia since IBOY was featuring it on his blog “An Iowa Garden” and I wanted to see more about it (you had a 2008 post about it). Thanks for posting the flowers to that plant! I love these pictures you have posted! You must have a large beautiful garden. I love your use of edibles in the garden. I try to incorporate them in mine as well. Welcome, Sylvana! I saw that Syneilesis post too. I’m glad to hear that you enjoyed the photos here too. Hi Rob! Oh, she’s very cute, while she lasts (which is about a week); then she’s pretty boring. [You are probably aware, but I’ll throw this into the mix . 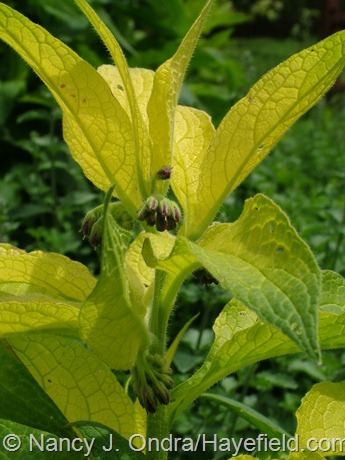 . .] Seneca Hill has a variegated version I picked up recently — Symphytum x uplandicum ‘Axminster Gold’. Obviously it hasn’t flowered for my yet, so my feelings on it are still to be determined, but it looks interesting. Guess time will tell . 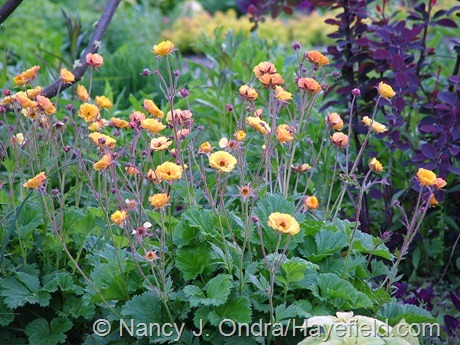 . .
‘Axminster Gold’ is definitely one of my all-time favorites. I’m sure you’ll love it too. It’s pricey but worth every penny!